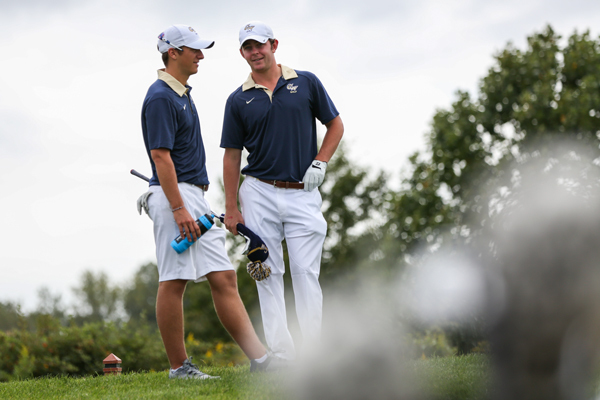 Pierre Tillement, left, and Jack Porcelli chat between holes during the George Mason Invitational golf tournament in Lorton, Va. Updated: Oct. 12, 2015 at 5:01 p.m.
Posted on the door to exit the team locker room are sheets of paper a bit brighter than buff, with sports mantras. There’s one from Phil Jackson. Over the past three years under head coach Chuck Scheinost, it’s become something of a zen room. The golf team now has a new set of lockers, a new putting green floor and a new driving range simulator in the small space under the hardwood floor of the Smith Center. Four full years removed from a surprise Atlantic 10 championship, the men’s golf team is deeper than ever and in pursuit of a new championship. They boast a squad of nine players, with three seniors, including two fresh faces to the roster’s A-team – redshirt sophomore and Purdue transfer Christian Cichan and freshman phenom Logan Lowe. With two meets left in its short fall season, GW is still working out the kinks. It’s a deep team with a lot of young talent and team chemistry well under par, though its short game still needs some work. By all measures, the Colonials should improve on last year’s ninth place finish in the conference championship. It is not only Scheinost who is confident in his team’s ability to get the job done. The confidence resonates from the players as well. So far this year, the team has shown signs that they are heading in the right direction. As its short games get better, the scoring gets lower – a key element of Scheinost’s philosophy. One of the team’s strongest putters, Cichan has already overcome some early troubles. The Boilermaker transfer had a rocky start in his first-ever collegiate round at Rutgers on Sept. 11, but a little talk with his coach helped his confidence come quickly back. He posted a team-best 4-over-par 214 in Colorado on Sept. 29. “Ever since that first day, I realized it’s just a round of golf and at the end of the day you’re just trying to put a golf ball in the little hole,” Cichan said. The freshman Lowe also tied GW’s all-time low score record for a round with a 66, 5-under-par – while also earning A-10 Rookie of the Week. That was in his first collegiate tournament, at Rutgers. Granted, the California kid came in off of a final round of 16 – only losing to the eventual champion – in the U.S. Junior Amateur Championship to earn a top-100 national ranking before coming to college. And even when some of the guys aren’t posting great scores, they have confidence in their improving game. While the top-five performers were in Colorado, junior Michael Heda and the rest of the team were at George Mason for an invitational on Sept. 27. Heda, a former team MVP, posted a first day, 36-hole total of 157, good for a tie for 80th out of 100. But assistant coach Andrew Szunyog said his scrambling was good on the day of tough conditions. It was odd for him and the rest of the teammates not to have the whole team around (they hang out nearly every night, watching college football, UFC or whatever is on TV and eating pizza) but Heda saw after his round that he had a few texts from his teammates asking him how it went. The chemistry is there, pushing the team as a whole forward its goals. The team will get closer as they continue to travel and play a tough national schedule. With the area’s lack of good weather during the late fall and early spring, the team must travel nationally to find good weather and challenging competition. Strength of schedule early in the year is an important aspect in preparing the team for the challenges they will face in A-10 play. Scheinost knows very well that competing within the conference is not easy. It’s a long way away though. They have two more meets before the fall season is up. Then the team will first help host an A-10 Match Play Championship down in Florida that Heda and his family helped Scheinost set up at their home golf course. When GW heads down to Orlando, Fla. for the conference championship on April 29, they’ll attempt to improve on last year’s ninth place finish out of the 11 teams. Although they don’t have last year’s leader Jack Persons, the team has more competition among themselves than they have in years. The fall meets have thrown the team’s talent into a Crock-Pot with the intention of the slow maturation process yielding better results by the end of the school year. Scheinost’s last name was misspelled in two locations. It is Scheinost, not Schienost. We regret this error.